Recapping the Saratoga Yearling Sale; Day 1: Day one of the Fasig-Tipton Saratoga Select yearling Sale on Monday, August 4, 2014 was a doozy! Big money everywhere! Colts and fillies were selling anywhere from $1.15 million to less than $100,000. Everyone knows I am a pedigree fanatic, so this was my chance to see how my picks would sell. I have a friend whom watched the auction with me, and here are some of the standouts we saw. Colts and fillies were selling anywhere from $1.15 million to less than $100,000 during Day 1 of the Fasig-Tipton Saratoga Sale on Monday, August 4, 2014. Hip 37, (Trappe Shot-La Prada), he doesn’t have the best pedigree, but the way he carried himself, and how professional he was, he as the standout of the night to me, even over the sales topper. He had very good bone and was built really well. 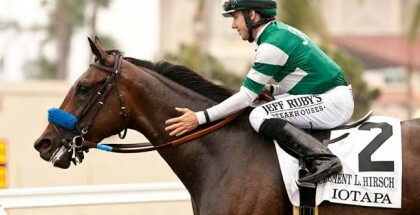 The colt was bought by Gary S. Broad for $170,000. Hip 39, (Bellamy Road-Lemon Crusta), this filly is one I circled, starred, and highlighted when I saw her in the catalog. Not a lot of people saw what I saw in the filly. She was plain filly, no white on her. She was a dark brown, good boned, averaged sized filly. Not big, not small, just a plain jane, so to speak. She could easily be a very versatile filly, relishing any distance. She was bought by Cheyenne Stables LLC for $100,000. Hip 55, (Lookin at Lucky-Noblest Reflection), This colt caught my eye on how flashy he was. A white face and four white feet, I did not expect this out of Lookin at Lucky. The colt was very athletic looking to me, and really caught my eye. He wasn’t the high priced colt of the sale by any means, selling for the second lowest price of only $70,000. EQB INC Agent for Bruce Lunsford bought the colt, and I am almost sure they will pinhook the colt for sale next year as a two year old. Hip 58, (Medaglia d’Oro-Passion Du Coeur), if this colt’s pedigree isn’t one of the best in the sale, then no one has a good enough pedigree to be in this sale. With Medaglia d’Oro, Distorted Humor, and Unbridled’s Song, the two latter sires in the bottom half, he wasn’t as big as I expected, but he was super calm and professional. He was sold for $675,000 by John Ferguson. He was the sales topper for a while. Hip 64, (Drosselmeyer-Queen of Empire), this colt was one I circled, starred, and highlighted as soon as I saw him in the catalog. By Belmont and Classic winner Drosselmeyer, this colt is out of an Empire Maker mare. 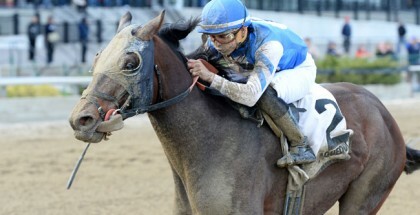 Empire Maker himself also won the Belmont Stakes. 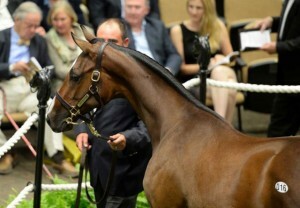 This colt had a great presence in the sales ring. Alert but not overly nervous, he stood well, and covered a lot of ground. He was quite tall, resembling more of the Empire Maker in his blood. His back was straight and long, making him look like he could run all day. Alex and Jo Ann Lieblong bought this colt for $300,000, which may be a steal for this colt down the road. Hip 69, (Tapit-Rote), The show stopping filly is what she was. At first, I thought I had read the program wrong. This tank of a yearling had to be a colt. Nope, I read it correct. This filly, by Tapit, out of a Tiznow mare, was in fact, a tank. She was also very professional in the sales ring. She stood over a lot of ground, like the Tiznow in her would show. Her thickness was a combination of Tapit and Tiznow. She was a lovely dark dappled grey/roan color. Bought by Regis Farms for a whopping $1,000,000. Keep her on your lists! Hip 81, (Tapit-She Be Wild), of course another Tapit would end up stealing the show. This small, but muscular, ghostly white filly was a spitting image of her sire. A very compact and tight filly, she did not like the sales ring in the slightest. She was jumpy and ansy. The pedigree she has made her worth the price tag. She was bought by Solis/Litt to become the sales topper at $1.15 million dollars. She should be a very precocious juvenile, and she will be fast. A live stream of the Fasig-Tipton Saratoga Sale Day 2 will be available for your viewing pleasure at Fasig-Tipton.com at 7:00 PM ET.